rates in public schools or industries. In Illinois, in a Veterans Administration hospital. Seombrotd Fi Poisoning Ne\ York (it . Trivalent Botulinun Antioxin . .
fluenza viruses were isolated from 10 cases. and to date. Utah, Virginia, Washington, and Wisconsin. cific toxins have been demonstrated in the laboratory. investigation and laboratory diagnostic services. -pecific typr followed by ty pes B. and F. respectively. 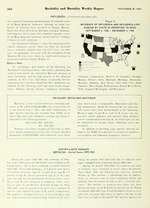 types compared with 53 percent during 1960-1967.
in botulism cases remained at levels above 60 percent. fastidious in their eating habits than adults. western states (California. V\ashington. Colorado. Oregon. breaks by reporting 10 of these. Of the type E outbreaks. tion of home-canneid \eetables. fruit-, or meat products. Los Angeles. (California. developed diplopia. dysphagia. difficultI in opening his e-es. and weakness of the limbs. -till requires constant a-sistance for respiration. xa.- detected in the patient's serum obtained on October 23. 20 minutes and then blended with onions, chicken skin. at room temperature, the jars are refrigerated at 42 F.. V.)., Chief. Division of Acute Disease Control. and C.A. prepared venison jerky (MMWR, Vol. 15. Nos. 41 and 42). Clostridium botulinum typi E in fish from the Great Lakes. bot ulnurt type E from the Pacific Coast of the United States. Microb iorogy Moscor, July 1966. p. 49. Edited by Ingran, M.
ani R -rts. T. A., Chapman and Haii, Limited. London. co ered in preschool siblings of school age cases. in at least four other schools in thi- area of Philadelph-ia. These cases are present l, heing inae-tigatnd. (Reported by Alfred S. Bogurki, l.I)., .1P.II.. dlrrttr. Division of Epidemiology. Leirii 1). Polk. i.).. .PI'.1 ..
number of cases recorded during the same period in 1967. Of these. 17.1 percent were reported from Africa. corded foeer cases this year than last. - t5 :- 75-57 9. I' in r .. I I 1 .1 "E .
fish market, and then washed, salted, and refrigerated. patients were treated with antiltii tamines. such as tuna. mackerel, bonito, albicore, and skipjack. produIct. Ja Ji M SI, and Biol S,(6):1487-528, 1955. 1). C., 1957. pp. 37-76.
amount of hsi.lamine i" virutally zero.